RAF Seat Type Parachute Assembly. 'Parachute, Single point, quick release with seat pack. Type C-2.' Stores reference 15A/197. Commonly referred to as the 'pilot's parachute'. Classic white webbing with central black & red fleck and an Irvin label on the front left riser. Correct fully rounded quick release (QR) box, waistbelt, ripcord housing, ripcord/handle and chocolate coloured backpad. The parachute pack itself is also manufactured in the less common chocolate brown cotton and has a small label printed 'Stores ref. 15A/197' and Air Ministry King's crown. It comes complete with bungee cords. The canopy is absent and the pack has been padded to appear complete. The webbing harness is in good/good '+' clean condition. It is unlabelled and there is no evidence of one having been removed. The pack is in very good to excellent condition with only light soiling. A seat cushion is fitted, this is rather grubby and although the Sorbo rubber insert feels a little 'stiff', it is still quite flexible. The backpad is in excellent condition bar light wear to the straps and stud fasteners. 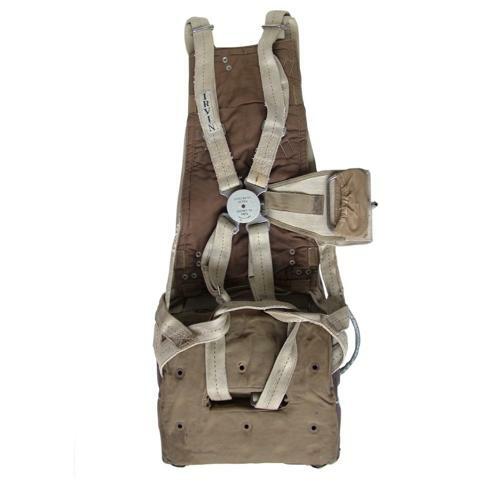 A very good example of a rare wartime seat harness. This makes an impressive display piece. Stock code S22810.